When Doug and I embarked on this adventure of reimagining our lives after 60 in a different state (NH) and state of mind (rural mountainside), I never imagined I would be writing about building materials with great interest. (Doug may have; it naturally appeals to the scientist in him.) But as much as we are into the wood, we are now into concrete, wraps, and foam. Excavator Dave fills a concrete form with more stone. In foreground, the part of the basement that will not be walkout. The concrete pads will hold supports, most for the timber frame. The concrete has been coming and coming. To date, 133.5 square yards of concrete have been poured from more than a dozen trucks and on two occasion with an assist from a huge concrete pump. And don’t think for a moment that concrete is boring. It takes focus, precision, and discipline to make everything right before the trucks roll in. They don’t wait around for last minute adjustments. They have to dump the load and move on. Our basic concrete is 3,500 pound; that means it can take a compressive load per square inch of 3,500 pounds (per square inch!). For the garage floor, part of the basement floor, and several piers (concrete poured in Sono Tubes secured by Big Foot underground forms) that will hold up the screen porch and deck, that strength has been kicked up to 4,000 and synthetic fiber added. Now the concrete of the basement hides layers and layers of other materials. Doug checking the Stego Wrap before the pour. Ace, concrete team mascot, eyes some blue board. The concrete will be sprayed to help it “cure” and waterproof it from minor indoor spills. Another layer of protective tar-based sealant will be painted on the outside of the foundation walls in places where they concrete is not faced with stone. The layers keep coming, and we haven’t even worked our way out of the basement. All manner of building materials are designed to keep warmth in (especially in -20 degree winters) and allow moisture out; thus preventing mold from forming. So we layer it on. On the structural insulated panels, we will be using a double layer of 15-pound felt (old fashioned) and Obydike Home Slicker wrap (new tech, which provides space for water to escape and pressure to equalize). The standing seam metal roof will have 30-pound felt as well as Grace Ice & Water Shield underlayment three feet up from the edge and in the valleys. The problem created by all these layers in today’s well-built, energy-efficient home is too tight an envelope. We’ve heard problems of negative-pressure houses filling with smoke when the range hood is turned on and a fireplace is burning. So, add another layer of complexity. We will have to have an air-exchange system to circulate the air and balance the air pressure. 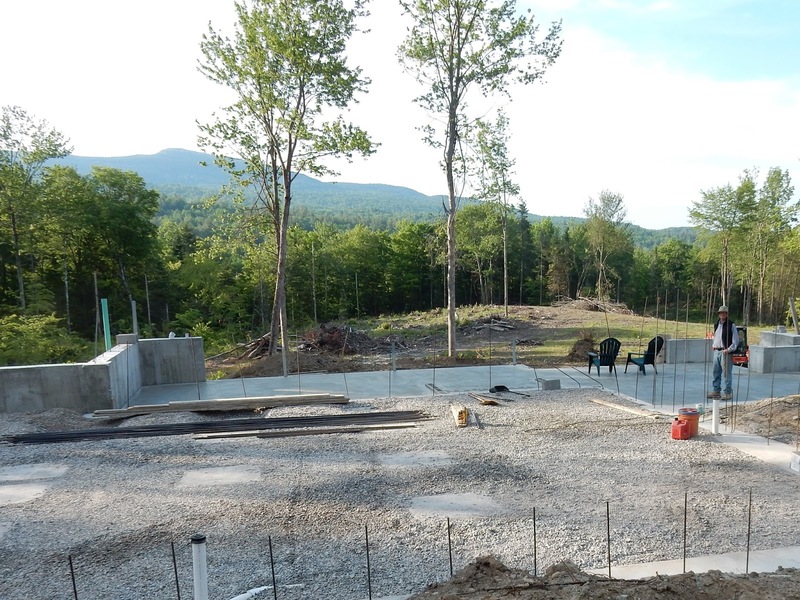 More forms coming on site; more concrete. The other night, sitting on our green plastic Adirondack chairs waiting for sunset, we wondered if, once the house is done, we will be able to (or want to) look at it and not think of all the layers (and work) that went into the final product. New York has its Thanksgiving Day Parade; Philadelphia, the Mummers; Pasadena, Calif., the Tournament of Roses; Pamplona, Spain, the Running of the Bulls; and ranking up there in originality, Brattleboro, Vt., hosts the Strolling of the Heifers. Early in June for the last 15 years, coinciding with national dairy month, and this year also with national cheese day (June 4), the southern Vermont town (population 11,765) draws thousands of people to watch a hundred decked-out heifers parade up the historic Main Street. The event celebrates local farming and food. Flower garlands as natural as the wearer. Young people from various area 4-H clubs, and farmers handle their heifers with skill. An occasional moo is heard and the cows do the expected, leaving behind what leaves cows’ behinds to be promptly cleaned up by a surprisingly eager team. Following the heifers (and musical interludes of various marching bands and fiddlers on a truck bed), come the antique tractors—Ford, John Deer, International—and their equally antique drivers. Local organizations, mostly nonprofits, proudly parade, taking up the rear, in farm-related costumes or colorful t-shirts. Strolling of the Heifers, the nonprofit farm and food advocacy organization that sponsors the festival (which also includes a Slow Living Expo to promote people’s conscious connection to the food they eat), recently announced its 2016 Locavore Index ranking states’ level of commitment to locally sourced food. Not surprisingly, Vermont tops the list followed by Maine, Oregon, Montana, and New Hampshire. Created five years ago, the index takes into account food sales from farmers to the public, community-supported agriculture, and farm-to-school program participation (added this year to the criteria). Vermont, the Green Mountain State, clearly wants to add the moniker of the Greenest State. A farmer coaxes a reluctant alpaca. the hills of New Hampshire.